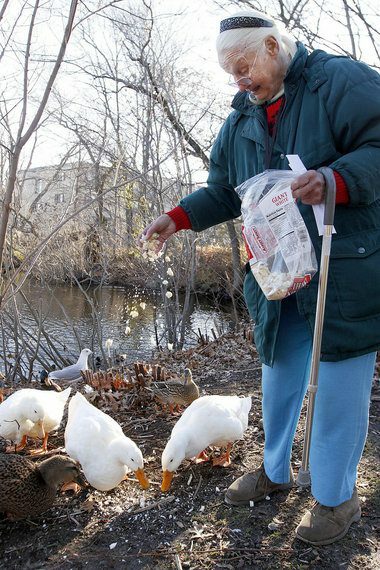 An 80-year-old old Massachusetts woman is willing to go to jail rather than quit feeding the ducks at a pond near her house. She says she worries about the health of her feathered friends — particularly during the winter when they have little to eat. “Claire Butcher says she’s only trying to make sure that a group of domestic ducks that made Flax Pond their home have enough to eat as the cold weather approaches,” writes Jeff McMenemy in the Lynn Daily Item newspaper. She says that’s why she recently resumed feeding the birds — in violation of a city ordinance and a No Trespass Order she agreed to in 2009, according to City Attorney Vincent Phelan. Police told ABC News that they intend to charge her with trespassing and violation of a city ordinance after a woman saw her feeding the birds recently, according to court documents. “Here I am, an 80-year-old woman and they’re treating me like a criminal,” she told McMenemy while she feeding the ducks as well as some local geese at the pond. She acknowledges being cited multiple times for violating the city’s ordinance, which forbids people from feeding wild geese, ducks or “other wildlife that may congregate” on or about the local Sluice Pond, Flax Pond or Goldfish Pond. The penalty is $100 per offense.